Polishing metal has never been easier! DWG Premium Metal Polish makes short work of polishing silver, chrome, brass, gold, stainless steel, platinum and other unpainted metal surfaces. DWG Premium Metal Polish works wonders cleaning a wide variety of unpainted metal surfaces. Just as DRI WASH ‘n GUARD® cleans, seals, polishes and protects painted metal surfaces, DWG Premium Metal Polish cleans, restores, and protects unpainted metal surfaces. Simply rub onto the metal surface, allow it to dry, then buff off lightly. It’s that easy! You can then seal and further protect the surface by applying DWG for the Car or Home. • All the unpainted metal surfaces around your home! Wash a car without water? When DRI WASH ‘n GUARD® Waterless Car Wash was introduced in 1991, the idea of a waterless car wash was simply unbelievable. An innovative technology that lifted the dirt from a vehicle — without water — leaving it completely clean. How could it be? 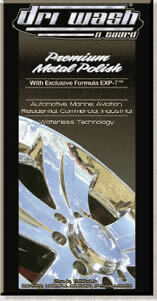 This truly revolutionary technology combines more than 50 ingredients with DWG’s exclusive PolyGuard-3™ formula. DWG forms a protective seal that resists the penetration of dirt for weeks and leaves a gleaming finish. A light buffing with a terry cloth towel whisks away the dirt along with the haze, leaving a sparkling shine! With one spray of DWG, the dirt is emulsified and broken down, then lifted and suspended in the fluid as the haze forms. This breakthrough product is so versatile that virtually any hard, non-porous surface can be cleaned, polished, and protected without water: cars, boats, recreational vehicles, trucks, skis, buses, motorcycles, airplanes, and much more! An innovation in car care — cleans, seals, polishes, and protects without using a single drop of water! DRI WASH ‘n GUARD® ULTRA-ION™ is specifically designed for the 21st century paints used on cars manufactured since the year 2000. It’s Ionic Technology not only helps repel dust from your vehicle’s surface, but also helps reduce and remove existing minor feather scratches. As you apply and buff the painted surface, you’ll be amazed at the results. DRI WASH‘n GUARD® ULTRA-ION™ will give a deeper, richer shine than any other product in the vehicle appearance industry. It is extremely aggressive in emulsifying all organic matter as well as bugs, bird droppings and tar and it works exceptionally well on glass, mirrors and chrome! DWG ULTRA-ION™ can be applied to dark colors in any natural occurring heat from the sun. This new formula is odorless and comes in a distinctive new color. 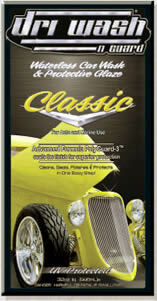 DRI WASH ‘n GUARD® ULTRA-ION™ - Newly enhanced to work on paints of ALL car models & years. It’s Ionic Technology not only helps repel dust from your vehicle’s surface, but also helps reduce and remove existing minor feather scratches. As you apply and buff the painted surface, you’ll be amazed at the results. DRI WASH ‘n GUARD® ULTRA-ION™ will give a deeper, richer shine than any other product in the vehicle appearance industry. It is extremely aggressive in emulsifying all organic matter as well as bugs, bird droppings and tar and it works exceptionally well on glass, mirrors and chrome! DWG ULTRA-ION™ can be applied to dark colors in any natural occurring heat from the sun. This new formula is odorless and comes in a distinctive new color. 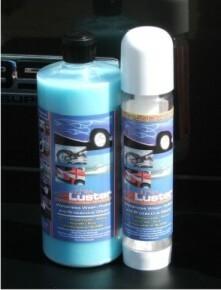 Why waste time, washing, drying and waxing your vehicle when you can do it all in ONE pass with UltraLuster. Simply Spray, Wipe, and Buff and you just cleaned, polished and applied an Acrylic Polymer that will protect your finish from the elements and harmful UV from the Sun. Our space-age lubricants and polymers protect your finish from scratching and leaves a bond of protection that beads water for months. Great gift idea for the person who takes special pride in their vehicle! !